After 150 years together, Hope and Holland still have a place for everyone. Holland has been good to Hope College. Allow us to return the favor. Hope College and the surrounding city have grown up together. Like an old friend, Hope has always opened our doors in warm welcome for the Holland community. Come for a visit, attend a lecture, take advantage of our facilities and get involved on campus. With the all-day festivities of picnics and sporting events, Community Day celebrates the long-standing relationship between Holland residents and Hope College. The event debuted in October 1966 as a Community Ox Roast, held in conjunction with the Hope College centennial celebration. The annual Winter Happening blends the community with the college’s academic excellence for an all-day event, featuring multiple seminars on a wide array of topics. Linked by both history and geography, the community of Holland and Hope College aren’t just neighbors, they’re family. 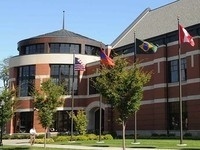 The impacting cycle the Holland area and Hope College have on one another is significant. With a prominent and proud town-gown relationship, the college is a major economic engine in West Michigan, contributing $213 million annually to the local economy. With the presence of the nearly 6,000 Hope alumni who live in the Holland region, the interconnectedness of the campus and community enhances each other. In short: Make yourself at home. Hope has 22 different NCAA varsity athletic teams to cheer on. There are more than 6,000 Hope College alumni living in the Holland area. With such a strong town-gown connection we are proud to call Holland our home.